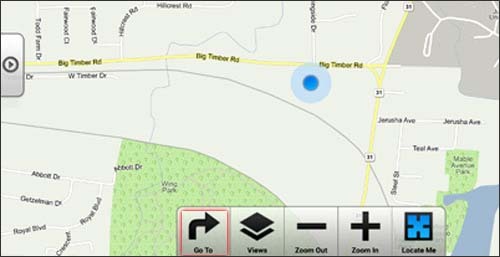 If desired, enter the name in the "Enter a Place Name" field then touch and hold location displayed in list. Alternatively, tap the Microphone icon (located on the left in the Search field) to conduct a voice search. Enter the location name in the "Enter a Place Name" field or select an option from the list displayed to perform a search based on type. 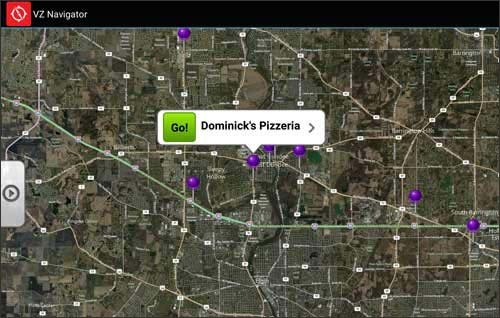 Tap the purple dot to display the location then tap the location name to display additional options. Alternatively, tap the Menu icon (located on the bottom-right) to diplay a list of all locations then tap the preferred location. If desired, select any of the following options (located at the bottom). Muestra un mapa de la ubicación. Ofrece opciones de navegación hacia la ubicación. Comparte la ubicación con el destinatario elegido. Agrega la ubicación a los favoritos. Proporciona otras opciones de rutas.